Babies are born without knee caps. They appear when the child reaches 2-6 years of age. The knee is the largest articular joint in the body. Each knee has two tough, rubbery menisci that act as shock absorbers in the joint. One meniscus sits on the inside of the knee joint and is referred to as the medial meniscus. The other meniscus rests on the outer part and is referred to as the lateral meniscus. Arthritis is one of the most common causes of knee bursitis. 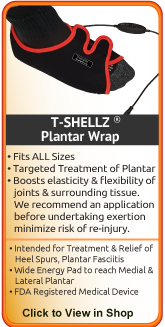 TShellz Wraps are highly effective treatments for knee bursitis. Runner's knee is not exactly a condition in itself. It sums up a multitude of knee disorders with different causes all centering around the kneecap. Obesity and improper body alignment are responsible for many knee injuries. Optimal knee treatment includes avoiding activity, icing the inflammation, gently stretching and warming the area. 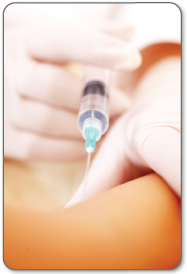 DTR treatments can speed ACL, PCL and meniscus recovery significantly. The knee may seem like a simple joint in the body but it is very complex. The kneecap acts as shock absorber (the cartilage on the underside), a lever for your leg and a protection for your joint. 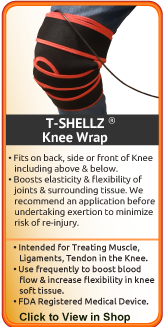 The kneecap glides smoothly over the surrounding tissue and bones as you straighten your knee. Patellar chondromalacia, is the softening and breakdown of the underside cartilage of the kneecap. This breakdown continues the cartilage tissue may cause it to crack, blister or shred into a mass of fibers. In severe cases the degeneration is complete and the cartilage is gone, the exposed bony surface of the kneecap will painfully grind against the other bones in the knee. This condition is also known as "Runner's Knee" or Patellofemoral Pain Syndrome. Much like arthritis that affects that cartilage of the bones you may have a dull, aching pain most often felt behind, below and on the sides of the kneecap. The pain often increases when using stairs, deep knee bends, squats, running up hill, jumping, getting out of a chair or when participating in activities that put weight on the knee. You may feel grinding or grating occurs when trying to straighten the knee. The feeling of having your knee 'catching' or as if it may give-way and buckle under you may be experienced. Swelling may also occur along with the pain and inflammation in the knee joint. If these symptoms become chronic, weakened quadriceps muscles may allow the leg to give out which can cause further injury to the knee or leg. The degeneration of cartilage, leading to chondromalacia resulting irritation, can be caused from many types of joint injures and disorders. Poorly aligned bones near the knee joint, such as knock-knee or bowed legs. Misalignment of the kneecap from an unbalanced in muscle strength or overpronation (when feet rotate inward). When functioning normally, the quadriceps (thigh) muscles pull the kneecap over the end of the femur in a straight line. Trauma to the kneecap, such as break (fracture) or dislocation of the kneecap. Overuse of the knee joint, runner's knee can due to repetitive knee rotations while biking, many cyclists experience chondromalacia resulting in chronic knee pain, usually located below the kneecap. Repeated bending or twisting of the knee joint. Chondromalacia is a condition often suffered by young athletes who perform repetitive knee movements such as cycling, running, or jumping. Knock-kneed individuals and flat-footed runners are at greatest risk as these conditions cause the patella to align toward the outer (lateral) side of the femur. As well, a larger percentage of women suffer from patellar chondromalacia due to anatomical differences between men and women that cause women to experience increased lateral forces on the kneecap. It's generally understood by doctors and surgeons, that surgery will introduce more scar tissue into the soft tissue of the knee. This added scar tissue will be problematic, requiring physical therapy and conservative treatment options post-surgery. This is why surgery is only performed as a last resort for chronic tendonitis injuries that won't heal with conservative treatment methods. Rest - This is important for initial healing because without an correct amount of rest you are at risk for increased inflammation, pain or injury to the soft tissue of the knee joint. Cold Compression - Immediate cold compression (using an Cold Compress or Ice Pack) will allow you to manage pain while getting rid of swelling, inflammation and edema in your knee. Deep Tissue Regeneration Therapy (DTR Therapy) - You can use your own blood flow to maximize your rehabilitation, decrease recovery time, and boost overall long-term healing. Using a simple conservative treatment such as cold compression to treat your knee injury will reduce swelling to "open up" the area for more blood flow. 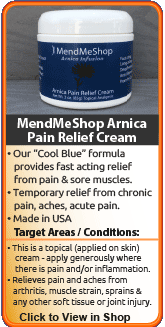 It will also slow nerve and cell function in the knee (and reduce pain). This is important because once blood vessels are damaged, they can no longer carry oxygenated blood to the meniscus and tissue cells begin to break-down. Anyone in the health-care business knows that your blood supplies the oxygen and much needed nutrients required to heal any soft tissue injuries. This is why for years doctors, trainers and other medical professional have recommended RICE (Rest, Ice, Compression, Elevation) to treat the pain and swelling of fresh injuries, chronic pain, and after any re-injury. Questions about Knee Pain and Injury? 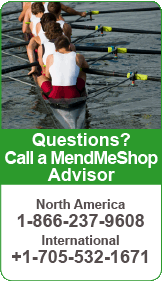 Call one of our MendMyKnee Advisers at no cost or obligation to address any lingering questions you have about your knee injury. We're here 7 days a week to provide the information you need to heal as quickly as possible. After the inflammation around your injured tendon has been reduced, you need to provide extra blood flow to strengthen your tendon tissue. Using Deep Tissue Regeneration Therapy (DTR Therapy), will help with your recovery and heal your tendon more completely. DTR Therapy increases the amount of blood that flows naturally to your soft tissue to nourish your tendons, improving elasticity and speeding the healing process. This increased circulation of blood to your knee tendon(s) and surrounding soft tissue is greatly needed for accelerating the tissue healing process. 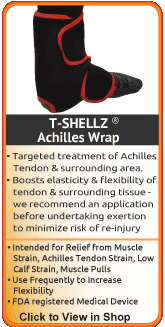 The only way to get DTR Therapy is through use of a Knee T•Shellz Wrap®. 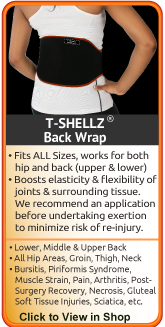 The T•Shellz Wrap® is the only treatment method that improves blood flow and circulation on a deep tissue level. Other methods of warming / heating tissue (hot water bottles, hot baths, etc) will only ever increase blood flow on a surface / skin level. These methods need a LOT of time to even reach the tendons in your knee on a deep tissue level. And even if you were to use them this long your skin would heat up to an uncomfortable level and may even burn you. 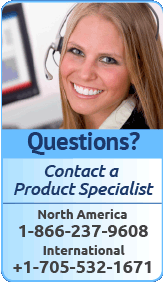 The best source of heat treatment is from a product where you don't even feel that much heat. When you don't feel the heat, it means the therapy is working in your deep soft tissue which is really where you need it. It's kind of like how your heart works in your body. You can't "feel" your heart pumping blood all around your body to your arms and legs. You can't even hear your own heartbeat without listening very closely. This is exactly how deep tissue DTR Therapy works too! 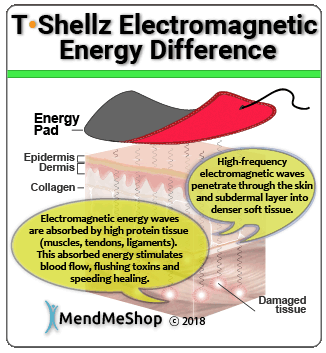 You're not supposed to "feel" a lot of heat because the heat isn't treating your skin, it's treating your peroneal tendon increasing the blood flow right in your tendon tissue. Slowing down the degeneration with can be achieved by avoid impact exercises and movement that irritates the patella until the muscle strength increases. Selective exercises that strengthen the inner quadriceps muscles are recommended to straighten the movement of the patella over the femur. During your recovery, you will probably have to modify and/or eliminate any activities that cause pain or discomfort in your knee area until your pain and inflammation settle. 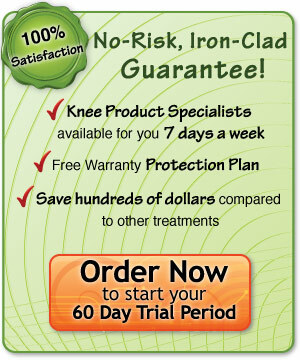 With these easy-to-use therapies, you will notice incredible improvement in your knee condition and pain. The more diligent you are with your treatment and rehabilitation, the faster you will see successful results and the sooner you can return to the activities you enjoy - without pain! The feedback we have received from so many people who have used our treatment options as part of their healing therapy has been overwhelmingly positive. 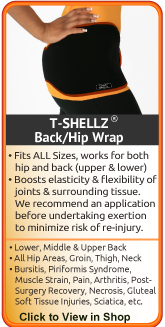 It can take a comprehensive approach when dealing with serious pain and discomfort...and the T•Shellz Wrap® and Cold Compress or Ice Pack certainly play critical roles in this aspect. If you're tired of being told that resting, drugs and surgery are the only answers to your knee pain...Be optimistic, because there are effective alternatives for you. 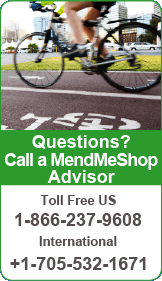 If you are still uncertain which route to go, do not hesitate to contact a MendMyKnee Advisor immediately by phone or email.